Auto engines commonly use both cubic inches and liters to describe their displacement volumes. Cubic inches ( in3 ) and liters ( L ) are both units of volume. Cubic inches is an imperial unit still used in engineering and a liter is a metric unit adopted into the international SI units. These two example problems show how to convert in3 to L and L to in3. Cube both of these values to get in3 and cm3. There are 1000 mL in one liter. 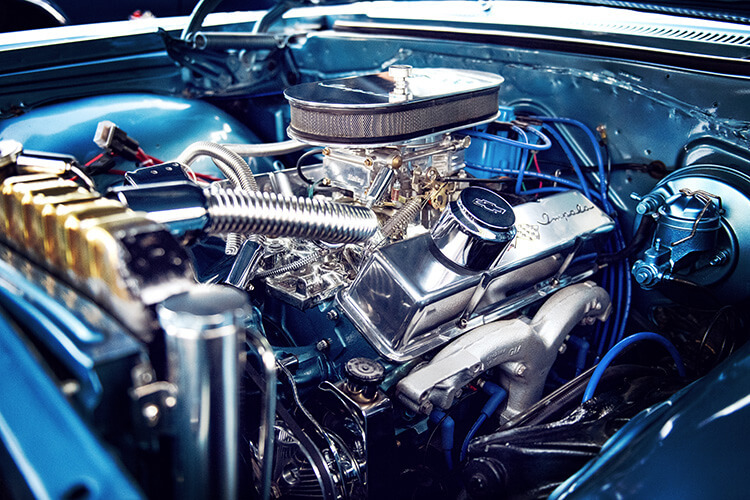 Question: Many small car engines on the road have an engine displacement of 150 cubic inches. What is this volume in Liters? Solution: Multiply the 150 in3 by the conversion factor where the undesired in3 unit is in the denominator. This allows us to cancel out the in3 and leave only the L unit. Answer: An engine displacement of 150 in3 is equal to 2.46 Liters. Question: Many modern V-8 engines are labeled as either 4.5 L or 5.0 L engines. How many cubic inches is a 5.0 L engine? Solution: Multiply the 5.0 L by the conversion factor. This time, put the L unit in the denominator to cancel it out. Answer: A 5.0 L engine has a 305 in3 engine displacement. The key to this type of problem is arranging your conversion factor to allow the unwanted unit to cancel out. A further detailed explanation of how this works can be found at How to Convert Between Units – The Ladder Method.